One Too Many Blows To the Head by J. B. Kohl and Eric Beetner, a Mysterious Review. 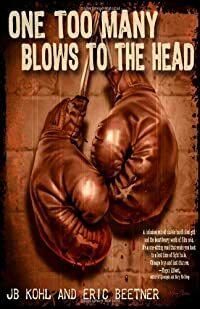 Review: Set in 1939, boxing manager Ray Ward pursues those who fixed a fight in which his brother was killed in One Too Many Blows To the Head, a noir-ish thriller by J. B. Kohl and Eric Beetner. Rex Ward is an up-and-comer in the sport of boxing. Managed by his brother Ray, he's not quite ready for the big time — Chicago — but a few key wins in their home town of Kansas City will set him up well. It's during one of these fights that Rex is killed, his face pummeled so hard it's virtually unrecognizable. Ray isn't naive, he knows fights can be and often are fixed, but suspects this was more than just an illegal take-down, and learns his brother's opponent was using weighted gloves. Determined to seek revenge — if not justice — Ray doesn't let anyone get in his way as he hunts down whoever ordered his brother permanently knocked out. [T]his was my fight. I'd been sending Rex into the ring for years to fight bouts I didn't have the skill for and I was tired of winning by proxy. I was tired of not feeling the deep satisfaction of a fist connecting with another man's flesh. I was tired of not being close enough to hear a rib bone break or get the warm splatter of an opponent's blood on my face. I had been ringside too long. As much as the story may seem to be about Ray Ward, it's also about Dean Fokoli, who has his own demons chasing him. They meet in the end, but it's a meeting of equals, men more alike than not. One Too Many Blows To the Head is quite remarkable in how it takes a relatively simple story and develops an intricate, compelling tale of two men on a mission to identify who killed Rex Ward … but also on a search for their own identities. Acknowledgment: Eric Beetner provided a copy of One Too Many Blows To the Head for this review.